New candidates applying to sit for a Certified Economic Developer exam taking place after December 31, 2014 must participate in a "Preparing for the CEcD Exam Workshop," either in-person or via webinar. This workshop provides candidates' with a complete overview of the Certified Economic Developer (CEcD) exam process, from application to the oral examination. They will learn tools and techniques for preparing for the exam and witness a mock oral interview. For employers, learn more about the value of having a Certified Economic Developer on staff: "Why It Matters to Hire a CEcD" (PDF article from IEDC's Economic Development Now newsletter). From a vibrant collection of start-ups to super-sized international companies such as General Mills, 3M, United Health Group, U.S. Bank and Cargill, Greater Minneapolis-Saint Paul has spread its bets over a rich range of businesses and industries. The 2014 Spring Conference will analyze trends in existing and emerging industries, while demonstrating how communities and regions can support, attract, and retain diverse sources of cluster-based activity amidst a changing global economic development landscape. All proceeds benefit the Minnesota Economic Development Foundation. Fee includes green fees, cart, transportation from Radisson Blu, refreshments, and box lunch. If you have already registered for the conference and would like to attend, please download and complete the special events registration form (PDF). Representing the spirit of the modern-day pioneer, the 2014 IEDC Annual Conference will explore how communities around the world are meeting fresh challenges and transforming their economies for the future.  How can economic development organizations bring new partners together to drive sustainable economic growth in their cities, towns, and regions?  Which converging markets will lead to new opportunities for local communities? How can economic developers help their local businesses to succeed in an economy where these businesses are responsible for an increasing share of new employment and wealth?  What new connections must be made and nurtured on a large and small scale in order to rebuild and sustain a robust middle class? How can communities reach beyond their borders to remain competitive in a globally connected age?  How can economic developers think creatively about the natural assets in their communities, and how can this creative thinking be translated into a strategy that works? Don't miss out on the largest international gathering of economic development professionals in the world. Learn more about this year's conference program. While the reshoring movement may still be in its early stages, there is real evidence of North American companies reconsidering the domestic option for manufacturing. Rapidly rising wages in Asia, higher oil costs, a broader understanding of total manufacturing and development costs, and the strategic impacts of offshoring, are some of factors that are making offshore look less attractive. There are also attractive factors such as lower U.S. and Canadian energy costs, a consumer preference for North American made products, and a depreciated dollar that are contributing. In this webinar, presenters will discuss the data and tools that make a strong case for reshoring. Harry Moser of the Reshoring Initiative will discuss how to assist companies to accurately assess their total cost of offshoring and consider the domestic alternative. Mark Condon of Datamyne will provide insights on key import data and how it can be useful to help identify companies that are good prospects for returning production to U.S. shores. Within minutes a disaster can turn an entire neighborhood, district, and city unrecognizable. Asset mapping and data collection before a crisis can speed up immediate, short, and long-term recovery efforts. With knowledge of the infrastructure, businesses, and community and industry assets, first responders can make quick, informed decisions to secure the area and provide the resources needed by impacted businesses. Using an accepted understanding of what existed prior to the disaster, developers can create short and long-term strategies. Attend this webinar to explore strategies for asset mapping and data collection to prepare your community for when disaster strikes. How effective are economic development strategies that seek to grow local entrepreneurship and small businesses? Todd Johnson at Gallup and Dell Gines at the Kansas City Fed explore the successes and challenges associated with this approach in an Economic Development podcast. Accrinet is a digital agency that assists economic development organizations in leveraging the Web to attract companies into the region, cultivate entrepreneurial efforts, manage and grow membership, raise money, publicize causes and communicate with key constituencies. Atlas is a niche economic development marketing and technology firm that helps economic developers effectively reach site selection and prospect audiences while generating the greatest gains in economic development recruitment, retention, and investor activity for the lowest cost. Atlas deliver branding, website development, GIS mapping, marketing strategy, and creative campaigns with a staff experienced in economic development. The exclusive "High Performance Economic Development Marketing Agency Partner for the International Economic Development Council", Atlas' economic development marketing work and technologies have been named among the best in the country by International industry and professional organizations across North America. Led by a former economic development practitioners Atlas has worked with 125+ different economic development clients in 43+ states. Our approach and experience means that our campaigns generate an average of three to as many as ten times the response of other campaigns. Since 1969, ESRI® has been giving customers around the world the power to think and plan geographically. The world leader in GIS, Esri technology is used in more than 300,000 organizations worldwide including each of the 200 largest cities in the United States, most national governments, and more than two-thirds of Fortune 500 companies. Esri's Location Analytics suite brings geography and business intelligence together, allowing economic developers to view data in revealing geographic patterns that enable better decision making. Learn more about site selection, business attraction/retention, and demographic analysis. Visit Esri in the exhibit hall and at www.esri.com/econdev. The City of Phoenix, Community and Economic Development Department is seeking proposals from qualified professional firms to provide Strategic Industry Sector Marketing Development professional services. To be eligible for consideration, proposals must be received by 11:00 a.m. MST - Friday, May 30, 2014. For more information or to download the RFP package please visit: phoenix.gov/econdev/businessced/index.html for details. Got openings? Place your job ad with IEDC and get four weeks of exposure to more than 20,000 economic development professionals across the nation and beyond. Simply fill out the online form. » Visit the Job Center for details on each listing. Did You Know IEDC Members Receive a Free Membership to GrantStation? Valued at $699 a year, this is an IEDC member benefit you should use! The International Economic Development Council (IEDC) is a non-profit membership organization serving economic developers. 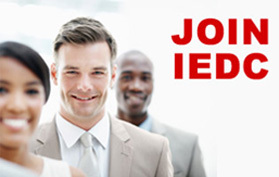 With more than 4,000 members, IEDC is the largest organization of its kind. Economic developers promote economic well-being and quality of life for their communities, by creating, retaining and expanding jobs that facilitate growth, enhance wealth and provide a stable tax base. From public to private, rural to urban, and local to international, IEDC's members are engaged in the full range of economic development experience. Given the breadth of economic development work, our members are employed in a wide variety of settings including local, state, provincial and federal governments, public private partnerships, chambers of commerce, universities and a variety of other institutions. When we succeed, our members create high-quality jobs, develop vibrant communities, and improve the quality of life in their regions.